Now you can make your own Orange Vinegar Cleaner Homemade Recipe and it’s totally natural and works a treat. Check out all the ideas now and watch the video too. Cleaning your home and surfaces is one of the most therapeutic things you can do for yourself and environment. Using natural products makes the experience more enjoyable, not to mention the fragrance. Whilst Lemons are great for cleaning, Oranges and even Grapefruit do a great job too. We’ve found you a great way to put those peels to good use. Turn them into a wonderful All Purpose Cleaner. Your surfaces will be left sparkling and your home will smell divine! There are also many other benefits as you can see from the infographic from Live Love Fruit above. Before we share the Cleaning Recipes with you, we thought we’d bring you up to speed with all the amazing health benefits of Oranges. As you can see it helps to prevent high blood pressure, it’s an immunity repairer and it can even relieve constipation. We love the Dr Axe Site. He always has great information and infographics on herbs and oils. We thought we would consult his website for details regarding Oranges. We found this infographic on Orange Oil and the associated benefits. Here’s what he has to say. As an all-natural method for improving immune function and fighting various ailments, orange oil has been a popular remedy in folk medicine throughout the Mediterranean, India, and China for hundreds, if not thousands, of years. Throughout history, orange oil has been used to treat widespread conditions, including poor digestion, chronic fatigue, depression, oral and skin infections, colds, flu, and low libido. It’s considered an effective antidepressant, antiseptic, antispasmodic, aphrodisiac, deodorant, digestive stimulant and circulation-booster! Over on Sonnets Kitchen, another of our favorite sites, Sonnet who is a Holistic Health Coach has come up with this easy breezy recipe. She knows how important it is to expose yourself to the right things, even when you are cleaning. As mentioned previously, chemicals can wreak havoc. Cut peel off of citrus fruit and place in jar. Cover with vinegar and allow to sit for two weeks. 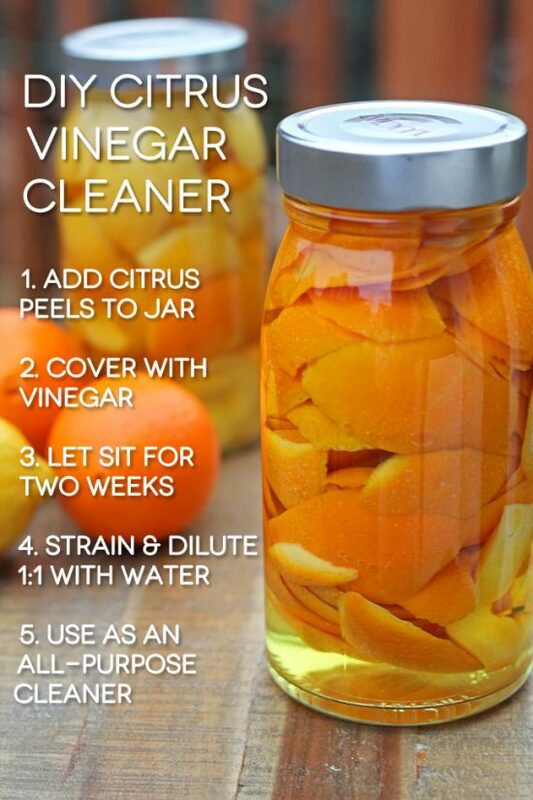 Remove peels and dilute vinegar 1:1 with water. You can use this mixture as a cleaner for windows, glass, counters, and mopping floors. Over on The Yummy Life, this Orange Spice Cleaner is one of many great recipes on offer. This is a naturally scented vinegar that is a great all-purpose cleaner that will leave your home smelling fresh and delicious. This spray will actually make you want to clean! Here’s a great recipe to make your own Cleaning Spray from Aromahead Institute and you can see they are using a combination of Lemon, Orange and Grapefruit. This would have an energising effect on your surroundings and the fragrance would be wonderful.